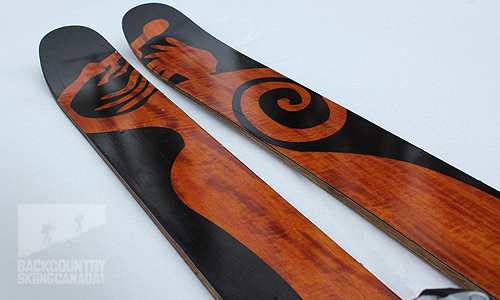 Skilogik Skis have been a yearly staple in our ski reviews simply because they make great skis and they have the added bonus of looking like works of art. 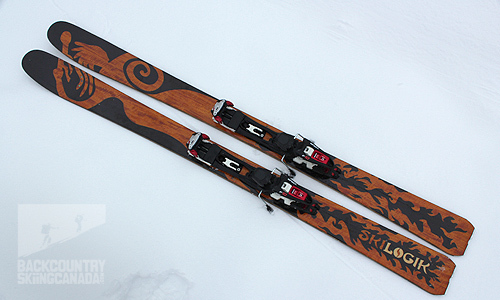 We began testing Skilogik skis way back in 2011 starting with the Skilogik Howitzer Skis, then the Skilogik Yeti Skis which were awarded our coveted Gear Of The Year Award, and just last year we reviewed the Skilogik Piton Skis. 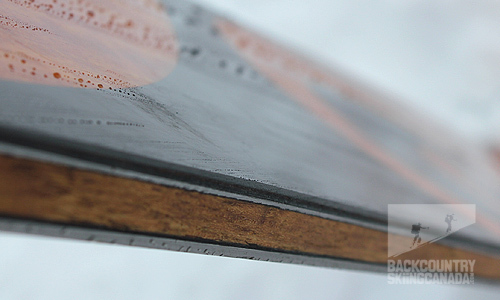 So what makes the Ullr’s Chariot BC different from the other skilogik skis we’ve tested? For starters this ski is in the same weight category as the others at just 3500 grams but offers up a much more stable ride due in part to the additional layers of Vektor 8™ Carbon Fibre in the ski. The Ullr’s Chariot BC also has a tighter turning radius than the Yeti, Piton and Howitzer making it easy to crank out tight linked turns while still being able to rail flat-out big GS turns. The traditional dimension ratio of 139/101/129mm allows the Ullr’s Chariot BC to carve super aggressive on groomers and make it so much fun to charge on. Having not skied the original Skilogik Ullr’s Chariot I cannot comment on how the BC (thats backcountry) version differs on snow but I can tell you that they are a full 800 grams lighter than their non-BC counterpart which puts them out of contention for anything except short forays into the backcountry or for the truly young at heart. 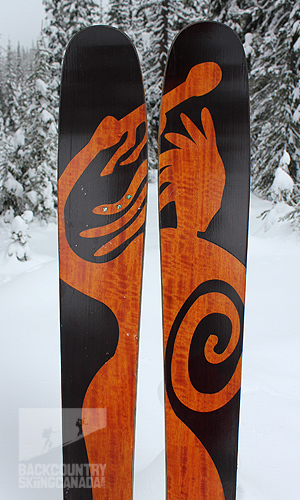 With a healthy early rise tip, minimal camber underfoot and only a slight tail flair the Ullr’s Chariot BC offer floatability in the pow and carving power on groomers. 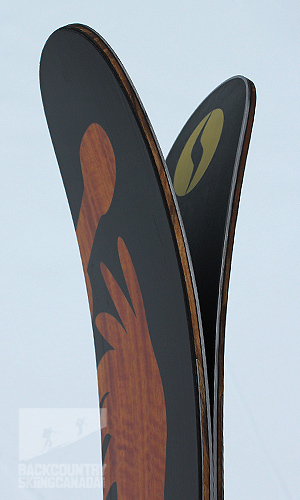 The 133mm splayed tail provides a solid finish to each turn and keeps you centred over the skis. The metal tail bumper ensures wear is kept to a minimum when ski mountaineering and the builtin skin notch keeps any tail clip in place. Camber under foot to help carve on a dime. Early rise tip and ski mountaineering friendly tail with built in metal bumper and skin notch. Did I mention that they are works of art? A closer look at the tail bumper which is very effective at keeping wear to a minimum. 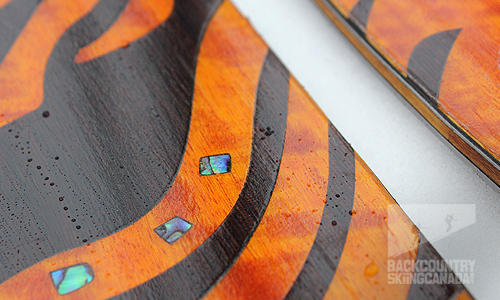 The integrated skin notch keeps your skins from moving around and ultimately falling off. The wood sidewalls are more durable than you think and if they are damaged you can always sand them out. 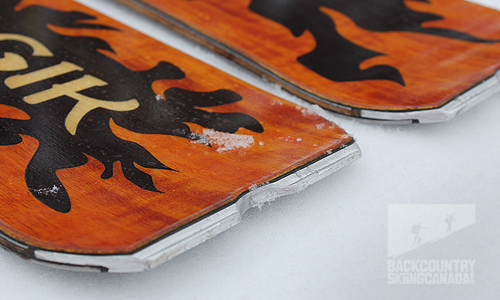 I can confidently say: “The Ullr’s Chariot BC is my new favourite Skilogik ski that I’ve tested to date”. Weighing in at roughly the same weight as the Skilogik Yeti and having very similar dimensions save 4mm underfoot the Ullr’s Chariot BC offers up a much more reliable performance on hard pack, groomers and crud. It takes them all in its stride and leaves them in its wake—no contest. While the Yeti has proven to be a lightweight ski touring machine in the two years I have been skiing it, it now has a challenger. The Ullr’s Chariot BC in my opinion is a more well rounded ski since it has the extra bulk (but not weight) to take on more challenging snow conditions where as I found the Skilogik Yeti and Piton can get pushed around in anything but light fluffy POW. The Ullr’s Chariot BC seems to do it all and do it well. 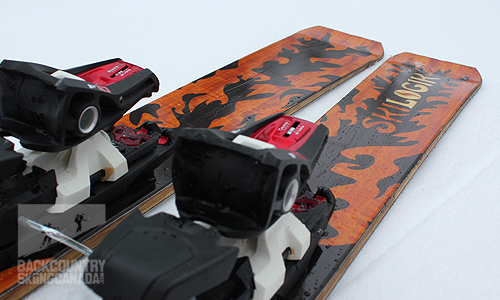 It holds an edge on big GS turns, likes to go fast and rail but can also be fun in the trees. It’s a solid ski, but still nimble. Touring over the last month I have found it to float well and be just as playful and fun in the pow. The skis early rise keeps you on top of the snow and makes for easy turning fun while on the groomers there is very little tip chatter which keeps the ski stable and firm. The only down side to the Skilogik Ullr’s Chariot BC is that I found is that it is not as forgiving in the bumps but overall I cannot say enough good things about this ski. I am glad Skilogik shaved some weight off the original Ullr’s Chariot to provide us weight conscious skiers the skin track friendly “BC” model. 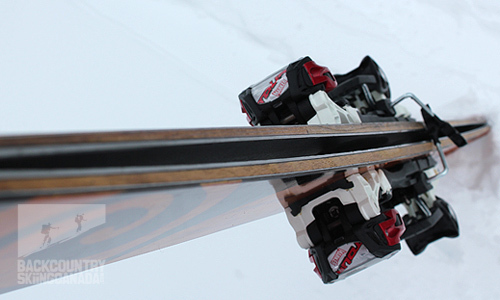 - The funnest Skilogik ski we have tested. - Light enough for backcountry skiing and beefy enough to pound laps at the resort. 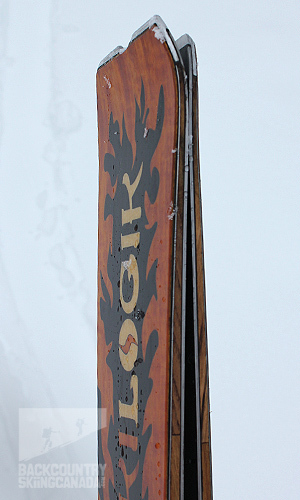 - Flat tail not only finishes the turn but provides the ability to anchor the skis when climbing peaks. - Built in tail notch holds skin clips in place. 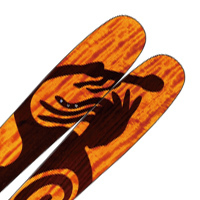 - A very solid ski for fast carving turns but still nimble for tight radius turns. - Customize your desired flex for just $100 more. - Custom top sheet designs for $100 more. - Too beautiful to scratch up. - Very minor tip chatter but does not effect stability or performance. - Not as forgiving in the bumps. - Only available in two lengths.